I get a daily feed from the Food News Journal, a great resource that serves up food news from all over the web. I discovered it when they featured one of my blog posts, and I'm so glad they found me. FNJ is one of my favorite sites now. 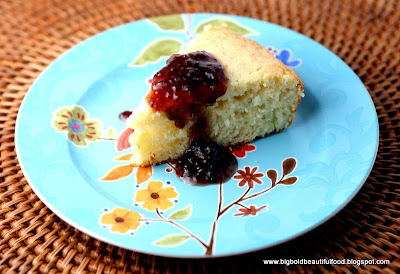 In the blog section of today's FNJ, I saw a link for Smitten Kitchen's Lime Yogurt Cake with Blackberry Sauce. A quick look at the recipe and the synapses in my brain immediately started firing away. Yogurt? Yes, I had some Fage from making a Greek-style dinner the other day. Limes? Yup, I had those from making a Mexican-style dinner last night. Blackberries? Nope, but I knew I had some raspberry preserves that I could thin down and use for the sauce. I ran home, turned on the stove, and whipped everything together in a snap. A little 30 minute visit to the oven and the cake was done. Light,tender, and moist, this cake is a winner. What a great spring and summer cake to bring to someone's house or to serve for brunch! Thank you, Smitten Kitchen. I've never made one of your recipes before, but I will be back. I now know why you are one of the Grande Dames of the Food Blog World. And thank you, Food News Journal. Keep up the great work as I love your site. It's so nice when you have all the ingredients to whip something up. It almost feels like it was meant to be. I think maybe I was meant to make this cake too! Lovely cake. It's so summery! I have seen this cake on smitten kitchen and haven't gotten around to make it. Glad to hear that it's good! YUM! What a delicious cake!